Hermès exotic skin handbags are worshipped by any Hermès lover and are virtually impossible to procure from an Hermès boutique. 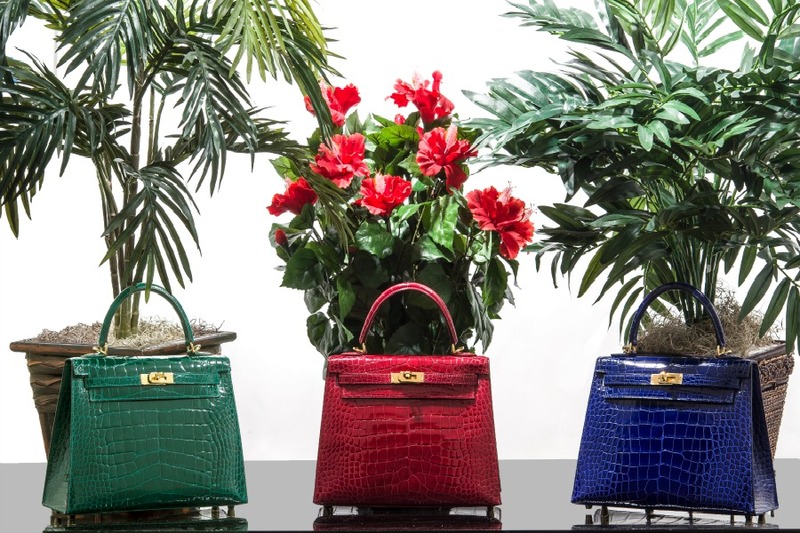 In recent years, Hermès has reserved their exotic handbags and accessories for their ultra VIP customers; those who have spent close to or above seven figures in store. This has created a scarcity of exotics, and we predict the price of these items in the secondary market will go up exponentially vs. the classic leather handbags. This is why many consider exotic Hermès handbags to be the best Hermès investment you can make! While the demand for these handbags is much higher than the supply, it is still possible to purchase exotic skin handbags and accessories online by trusted sellers and curators, such as Madison Avenue Couture. We have been selling authentic Hermès handbags for many years, and our knowledge of this ultra-luxury brand and their products is the most extensive in the business. Below is a list of all the Hermès exotic skins used to make handbags and accessories. Found in both matte and shiny presentation, alligator has the distinct characteristic of being symmetrical. Their scales are larger in the center and become smaller towards the sides. 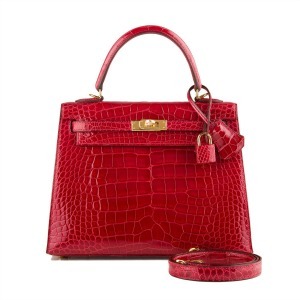 Alligator skin handbags and accessories can be recognized by the square sign next to the Hermès stamp. The above Kelly alligator handbags are in the coveted 25cm size. 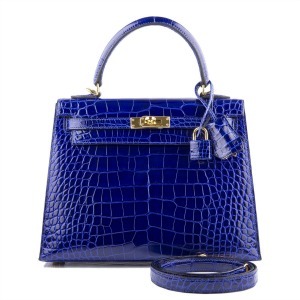 Unless you’re a frequent Hermès shopper who has spent close to seven figures at the boutique, you will not be offered an exotic Kelly in this size. However, you can purchase one today at Madison Avenue Couture. The resale value for crocodile is higher. However, Hermès is making more alligator handbags in this size because they really show off the beauty of the scales. Another in-demand Hermès exotic skin is crocodile, which comes in two iterations: Niloticus and Porosus, depending on where they’re sourced: the Nile river and Asia/Australia, respectively. Niloticus (pictured left) usually has larger scales, while Porosus’ are more defined, making it the highest priced exotic skin produced by Hermès. A Crocodile Porosus handbag kept in its box in like-new condition could fetch double its original price in the secondary market. The most striking characteristic of Crocodile skin is the small pores seen in each scale. If those features are not enough to help you distinguish them, Niloticus Crocodile is marked with a “••” and you will recognize Porosus by the “ˆ” mark. Another one of Hermès rare and special exotic skins is Lizard. More often than not, you can find lizard in small accessories and as accent on larger bags, for example the H buckle of a Constance bag. However, there are rare occasions when Hermès will use Lizard for a bag. Such is the case of the above Gris Elephant Lizard Birkin 25cm. 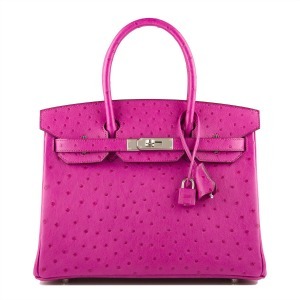 Note how the size of the small scales give this Birkin a beautiful sheen. Ostrich skin is instantly recognizable by its large size pores, which give it a “spotted” look. 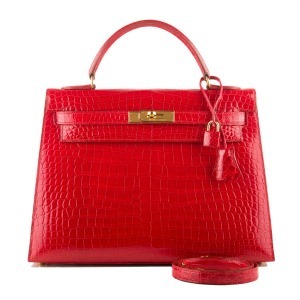 This is the most durable Hermès exotic skin: lightweight, water resistant and exceptionally sturdy. Ostrich bags hold their shape well over time, making it a popular leather for those bags you carry often. Hermès exotic skins are constantly on rotation season after season. Every once in a while we will see an even rarer Hermès exotic skin bag, like elephant hide. The best way to know when we get an ultra rare exotic is by subscribing to Madison Avenue Couture’s email newsletter. Hermes Crocodile and Alligator; What’s the Difference?